December 10, 2013 – Sel Kardan, President and CEO of The Colburn School, announced today the establishment of The Ziering-Conlon Initiative for Recovered Voices at the Colburn School. Los Angeles philanthropist Marilyn Ziering has made the Initiative possible with a generous $1 million gift to Colburn. 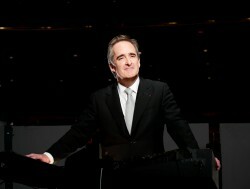 The Initiative builds upon the Recovered Voices project at LA Opera, established to support conductor James Conlon’s long-term commitment to bring attention to the works of important composers whose music was suppressed during the Nazi years in Europe. A major element of The Ziering-Conlon Initiative will be an annual one-semester seminar developed, overseen and taught by Mr. Conlon in consultation with Conservatory Dean Richard Beene for Colburn Conservatory undergraduate and graduate students, and, as a gift to the community, the seminar may be audited by the general public at no cost, but registration is necessary. To register to audit, please visit: www.colburnschool.edu/adultstudies. The first seminar begins on Monday, January 13 from 5:30 to 7:30 p.m., and will continue weekly through April 28. Mr. Conlon will be assisted in the course by Mr. Robert Elias, President of The OREL Foundation, and other guest scholars. This course will examine two generations of composers who were active and, in many cases, very successful and influential in Europe prior to the entrenchment and dominance of the National Socialist German Workers Party (Nazi) party in Germany from 1933 to 1945. The music and lives of these composers—most, though not all of them, Jewish—will be examined in depth. The course will also review the lives and works of composers who lived in exile during those years, some of them here in Los Angeles. It will examine a variety of questions: Who were these composers and why do we know so little of their music? What were the artists’ artistic milieus? Why were these composers and their works suppressed? What happens when art collides with its society? Why were the works of these composers, many of whom having thrived before 1933, not revived after World War II? How do composers express themselves in times of great upheaval and personal duress? What are the challenges in reviving excellent, though relatively unknown, works?